I am hosting a Pampered Chef party and thought that I would extend the invitation to all of my wonderful readers. Here is the link if you would like to order or look around: Christina. This months Guest Special is one of the better ones too. 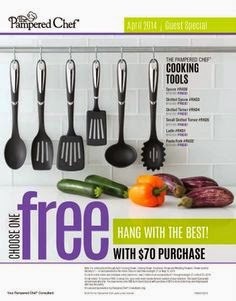 FREE cooking tool with an order of $70 or more. I love me some Pampered Chef. I have some cleaning brushes and a new spatula on my wish list. Last party I ordered cooking stones, and they have done wonders for my bread baking. The party closes on April 8th.